*Tip: A garlic press works well if you have one. I like to grate both the garlic clove and the ginger using a citrus zester. Both ginger and garlic have intense flavors. The zester gives each a fine grate that allows them to disintegrate into the sauce, so you get the flavor, without the overpowering “mouth feel” of texture. 1. Wash and drain the chicken. Over medium-high heat, preheat the vegetable oil in a frying pan. While the oil is heating, season the chicken wings with salt and pepper. 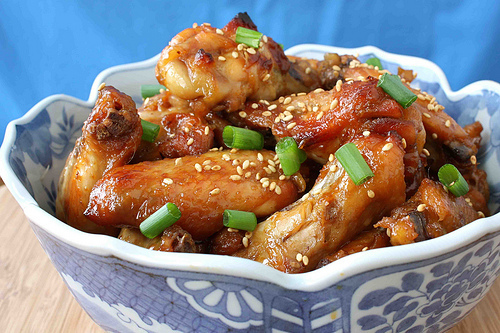 Coat the chicken wings in flour, shaking off any excess. (You only want a light crust on the wings, so an egg wash isn’t necessary). 2. Cook until the edges begin to lightly brown, and turn the chicken over. (Approximately 5-7 minutes on each side, depending on the size of the pieces). Drain well on paper towels. 3. Set aside the sesame seeds and scallions. To make the sauce, combine all remaining ingredients in a medium sauce pan over low heat. Stir constantly until the preserves break down and all ingredients are blended. Bring to a low boil, continuing to stir. Remove from heat. The sauce should have a syrupy consistency. *Tip: This sauce has very high sugar content and can burn easily. Keep the ingredients moving constantly so nothing settles in the bottom of the pan, prevent sticking and burning!) If the sauce begins to overheat, remove from heat, but keep stirring. The sauce will thicken as it heats up. If it heats too fast it may become too thick. To thin it out a little, add 1/2 tsp rice vinegar and add water 1 Tbsp at a time as you need it. Remove from heat and pour into a large mixing bowl. Add the wings to the bowl and toss. Sprinkle with scallions and sesame seeds, and toss once more to evenly coat.